If the temptation to DIY is strong, defer to the five-person team at this intimate shop. For the uninitiated: It’s first-come, first-serve (they don’t take appointments; expect a line), and the near-uniform approach to cuts — subtle gradational fading on the sides, full on top — is universally flattering. Tip: The longer wait for scissor time with owner Rob Baumiester is totally worth it. // Starting at $26; 1810 East Passyunk Avenue, East Passyunk. A decade after saying goodbye to barbering, Steve Duross has returned to the biz, opening a barbershop adjacent to his women’s salon. Signature cuts come with a complimentary travel-size product from the in-house line, Joe Grooming. The scruff-averse favor the Frequent Flyer program, which offers a discount to guys who make an appointment within three weeks of their last visit. // Starting at $25; 117 South 13th Street, second floor, Midtown Village. Barbershops can have negative reps as modern-day boys’ clubs, but the characterization couldn’t be less apt for this homey corner shop; the staff is predominately female, and neighborhood regulars often stop by just to chat. The service menu is refreshingly pared down (only beard trims, straight shaves, cleanups and men’s haircuts), and they offer cuts for little ones, too. // Starting at $30; 2401 Lombard Street, Grad Hospital. 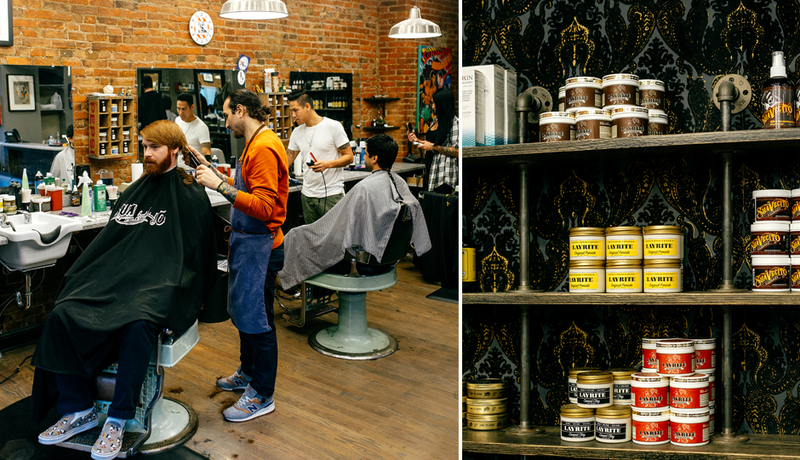 Don’t let the historic address intimidate you: This mainstay barbershop, open to non-members, is anything but fussy thanks to its in-and-out service, longtime barbers (ask for client-favorite Murray) and wallet-friendly prices (cuts are just $20). Enter through the club’s doors, veer left, and take the elevator to the third floor, where you’ll find the retro shop. // 215 South 16th Street, third floor, Rittenhouse. The looks achieved at this trio of hip salons are as varied as the shops themselves: rocker-cool pompadours at the garage-like Washington Square West outpost; intricate fades at the avocado-hued Grad Hospital shop; Technicolor tresses at the newest Bella Vista location. The most mop-headed men we know swear by the stylists at all spots for their wizard-like ability to tame wild curls. // Starting at $40; multiple locations. Keep hair looking and feeling healthy with British-born Truefitt & Hill Thickening Shampoo and Replenishing Conditioner. The combo, made with strengthening milk and wheat proteins, boasts a subtle citrus-melon fragrance and promises to fatten up follicles for a full Bradley Cooper-esque mane. // $30 each at 2B Groomed Studios, Washington Square West. Published as “The Philly Guy’s Grooming Manual” in the January 2017 issue of Philadelphia magazine.